Every student will take a gateway course during which their knowledge, skills and abilities will be assessed to award advanced standing credit. Thanks to a new transfer agreement between Tidewater Community College and Old Dominion University, adult and non-traditional students can earn college credit for their knowledge, training and skills in the workplace. The agreement aims to address the growing needs of local business and industry partners by providing college credit to skilled workers who often need formal education to advance their careers. 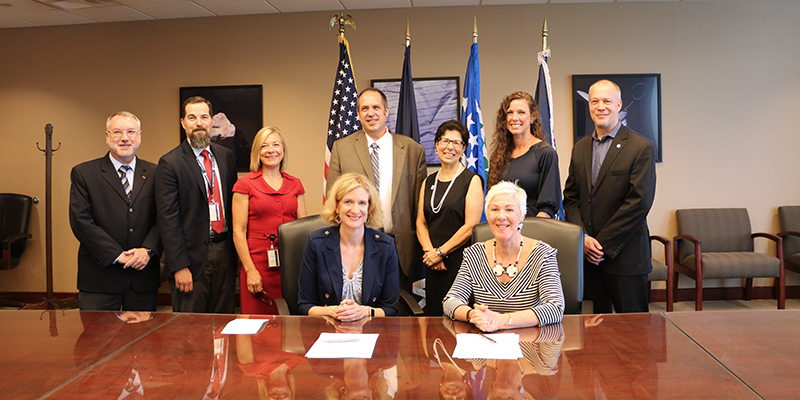 Old Dominion’s Ellen Neufeldt, vice president for student engagement and enrollment services, joined Edna Baehre-Kolovani, president of TCC, at a signing ceremony on May 21. Students who earn TCC’s Associate of Applied Science in Technical Studies with a Specialization in Technical Supervision, and have significant and documented occupational experience and technical training, can seamlessly transition to ODU’s industrial technology major, offered through the Darden College of Education. Various businesses, industries and agencies, such as Virginia Natural Gas and apprenticeship partners, approached TCC to explore how the college can help highly-skilled employees bridge the gap between professional expertise and formal education. Kellie Sorey, TCC’s associate vice president for academics, said TCC welcomes opportunities to meet employers’ needs in innovative ways. “The Technical Studies associate degree with the Technical Supervision specialization will allow TCC and ODU to recognize and reward individuals for their unique and significant work experiences in business and industry, the military and registered apprenticeship programs,” she said. Those with documented technical skills and professional experience can receive nearly half of the associate degree with advanced standing credit, “putting them well on the way to completing the associate and bachelor degrees.” ODU will accept all credits awarded by TCC, she said. Every student will take a new gateway course, co-created and co-taught by TCC and ODU faculty, during which their knowledge, skills and abilities will be assessed in order to award advanced standing credit. Jim Kibler, president of Virginia Natural Gas, said his rapidly growing industry has many good employees who need formal education to advance. “I am very pleased to see the positive result of the strong partnership between ODU and TCC,” said ODU Provost and Vice President for Academic Affairs Austin Agho. “This innovative, collaborative articulation agreement provides eligible TCC graduates the opportunity to seamlessly transfer into the bachelor of science occupational and technical studies degree at Old Dominion University. Petros Katsioloudis, chair of ODU’s STEM Education and Professional Studies Department, and a leader in creating the new agreement, said it meets a clear need. Tammi Dice, associate dean for undergraduate education at the Darden College of Education, added that the College “extends the benefits of higher education to corporations. Ultimately, students can minimize unnecessary coursework based on prior learning assessments, which allows them to re-enter the workforce with a degree sooner and with advanced skill,” she said. Those who have completed registered apprenticeships, active duty and transitioning military, and employees of companies with highly structured and robust training programs are ideal candidates. For details on TCC’s new associate degree, visit www.tcc.edu/technical-supervision.